Experts with a unique combination of software + performance experience. 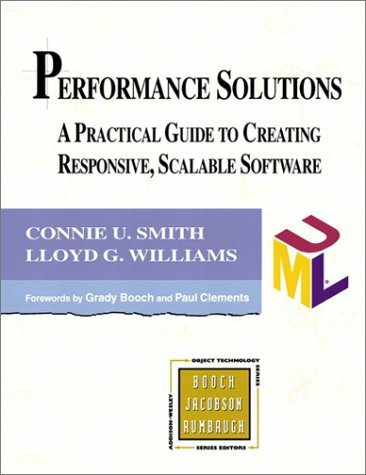 Performance Solutions: A Practical Guide to Creating Responsive, Scalable Software. It is in the Object Technology Series published by Addision-Wesley. You can order it from Amazon. Performance Engineering of Software Systems is the classic SPE book by Dr. Connie U. Smith. It is unfortunately out of print. You may be able to find a used copy. Performance failures negatively impact your bottom line by increasing costs, decreasing revenue or both. This paper shows how performance failures can be cost-effectively prevented. It provides background material on financial analysis techniques and shows how to use them to make your own business case. Feel free to use this information to help justify SPE in your organization. If successful, please contact us for assistance on your initial projects to help you achieve quick success. Our approach is unique and has proven successful time after time. When serious performance problems occur in newly developed software or existing systems with sudden increases in usage, they must be fixed immediately. The project often goes into "crisis mode" in an attempt to tune or even redesign the software to meet performance requirements. In these situations it is vital to maximize the performance and capacity payoff of your tuning effors. This white paper presents a systematic, quantitative approach to performance tuning that helps you quickly find problems, identify potential solutions, and prioritize your efforts to achieve the greatest improvements with the least effort. Software Performance Engineering: What Can It Do For You? Dr. Smith's CMG 2011 Michelson Session Presentation, CMG, Washington National Harbor, Dec. 2011. Five Steps to Establish Software Performance Engineering in Your Organization, Proc. CMG, Reno, NV, Dec. 2006. Best Practices for Software Performance Engineering, Proc. CMG, Dallas, Dec. 2003. Software Performance Engineering, in UML for Real: Design of Embedded Real-Time Systems , Luciano Lavagno, Grant Martin, Bran Selic ed., Kluwer, 2003. Building Responsive and Scalable Web Applications, Proc. CMG, Orlando, December 2000. QSEM: Quantitative Scalability Evaluation Method, Proc. CMG, Orlando, Dec. 2005. Web Application Scalability: A Model Based Approach, Proc. CMG, Las Vegas, Dec. 2004. PASASM: An Architectural Approach to Fixing Software Performance Problems, Proc. CMG, Reno, NV, Dec. 2002. Performance and Scalability of Distributed Software Architectures: An SPE Approach, Journal Parallel and Distributed Computing Practices, 2002. Performance Engineering Evaluation of Object-Oriented Systems with SPE·ED, in R. Marie,et.al. Eds., Lecture Notes in Computer Science 1245: Computer Performance Evaluation Modelling Techniques and Tools, Springer, 1997 (with L.G.Williams). Performance Engineering of CORBA-based Distributed Systems with SPE·ED, in R. Puigjaner,et.al. Eds., Lecture Notes in Computer Science: Computer Performance Evaluation Modelling Techniques and Tools, Springer, 1998 (with L.G.Williams). Software Performance AntiPatterns, Proc. 2nd Int. Workshop on Software and Performance , Ottawa, September 2000. New Software Performance Antipatterns:More Ways to Shoot Yourself in the Foot, Proc. CMG, Reno, Dec., 2002. More New Software Performance Antipatterns: Even More Ways to Shoot Yourself in the Foot, Proc. CMG, Dallas, Dec. 2003. Go to our home page for information about other training, services, and products. © Copyright 2002-15 by Performance Engineering Services. All rights reserved.